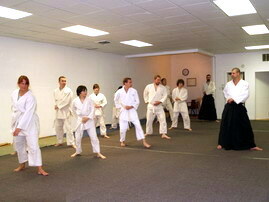 Interested in finding out if Aikido Seikikai is for you? Come with an empty cup, and ensure yourself an enjoyable experience. Participate in our introductory classes. You can jump in at any time. There is absolutely no obligation to sign up. Just remember to be in comfortable clothing. We look forward to having you join us soon. Prior to your visit, please check Dojo Hours of operation by clicking here.